Now, with the Bethesda published 2016 iteration coming to the Nintendo Switch later this year, DOOM can be small and dumb, while still having its trademark 'BFG'. 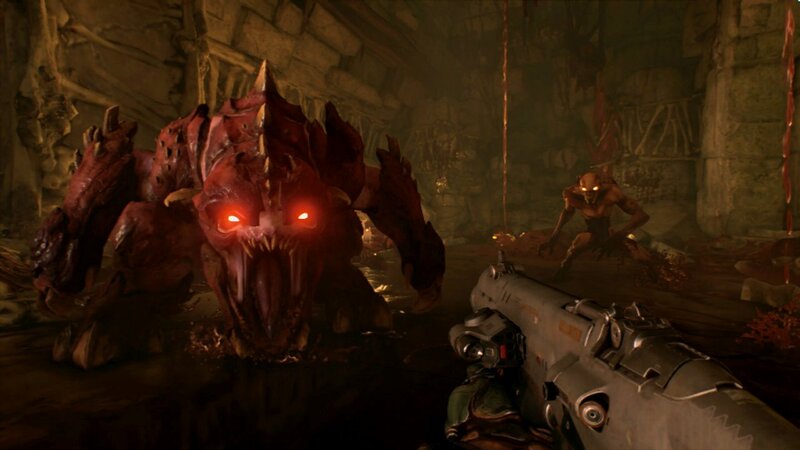 We got our chance to try out id Software’s upcoming port of its DOOM franchise reboot at a Bethesda event earlier this month; look, we know what questions you probably have regarding how it runs on the Switch, but first let’s start with the basics. DOOM is the first person shooter that begat all first person shooters. That is, along with the similarly rebooted Wolfenstein series, also published by Bethesda, the landscape of video games is what it is today thanks in tremendous part to that original, MS-DOS killer app. Regarding the 2016 version, what makes this game so special is that it rights the wrongs of the plodding, suspenseful-horror trappings of 2004’s DOOM 3, instead choosing to return to the original titles’ bread and butter: demons and adrenaline. So, so much adrenaline. Apologies if calling the game “dumb” offends; it’s DOOM’s return to minimal plot and amplification of style that merits that description. And it’s a total complement; the idea to make DOOM kinetic versus introspective just works. 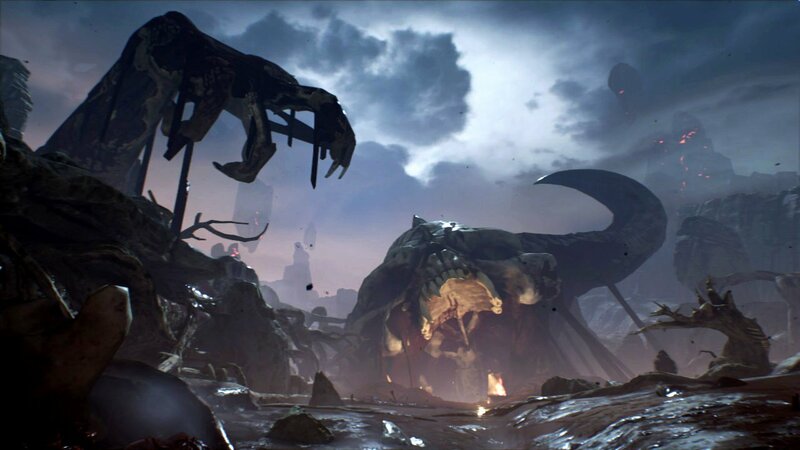 If you haven’t played DOOM on another platform yet, here’s the plot: You’re on Mars. You awaken on some sort of altar, chained down and surrounded by zombie-demons. Upon escaping your shackles by sheer force, you pick up a gun, quickly find a bodysuit, and start shooting devil-spawn throughout the nooks and crannies of industrial Mars. Pulitzer Prizes aside, the game is all the better for its simplicity, and this point is driven home by the game’s killer soundtrack, composed by Mick Gordon. Typical first person shooter elevator rides and door unlockings bookend your encounters with enemy demons, which are often punctuated by screaming guitar and pulsing drum and bass. The effect this has on gameplay is that each area you encounter quickly transforms into - almost - a sort-of rhythm game, where instead of cowering from your enemies the thrill of the soundtrack propels you to slam, shoot, dismember and explode your way past anything that gets in your way. Yeah, it’s pretty fun. We played the Switch version in tabletop mode, wearing headphones and predominantly holding a Switch Pro Controller. “With a Pro Controller” was, as we were told, “the preferred way” to play the game. Unfortunately, Bethesda is correct. We also played the game using only the attached Joy-Cons on the screen, and though the game absolutely functions as intended, the heavy reliance to push down on the joysticks to perform killing blows while also frantically running around feels a bit touchy with the Joy-Cons. You get used to it, but the Pro Controller is better. Still, playing DOOM on the go is a neat feat, no doubt about it. The game runs smoothly without a single noticed drop in framerate during the first two levels. Yet a key cut seems to have been made - in this build we're looking at 30fps when playing on the portable, not the 60fps that was so celebrated on other consoles and the target for pretty much all PC owners. That's something we'll have to get used to for such a fast-paced shooter, and is the price we may pay for portability. Nevertheless to the naked eye it’s apparent that this is, as they say, “a next-gen” title. Bloom lighting, detailed character models and expertly placed motion blur - it’s all there, and it all looks, somewhat surprisingly, pretty great. It would be a stretch to say that the game looks noticeably worse on the Switch portable screen than any other version of the game - it didn’t to us. In the future, when we get to play the game blown up onto a TV, perhaps compromises may be more visible, though it’s hard to imagine the average player would find too much fault in this build. A good looking game is a good looking game, and that earnestly describes DOOM on Switch, even if it doesn't necessarily completely match up with other console iterations. There are more pressing limitations apparent in this version, however. Between-level loading times are noticeably longer than, at least, the PC version. Also, this build of the game, which was described to us as “pretty much the entire game”, crashed on at least two different occasions among the attendees playing. Whether that’s early build jitters or actual hardware limitations is still to be determined. Also in the mix is the multiplayer - not playable that day - as well as all the DLC. Bethesda says they all will all be included with the Switch version, in full. As a footnote, physical copies of the game will require a download in order to first play multiplayer mode. After a solid hour with the game, something about DOOM’s arcade style of gameplay lends itself extremely well to a literal pick-up-and-play game session. Both those who have never played the game and returning fans looking to have another romp are definitely in for a treat. And despite the absence of the game’s “SnapMode”, a missing feature from the Switch version where you could modify your own multiplayer maps, this is still a great way to experience DOOM. But as this is arguably the first Switch port of a recent enough, next-gen, blockbuster title, a lot of critical eyes will fall on DOOM, treating it as a sort of a measuring stick for what the console can do, for better or for worse. So to hell with it. It looks like with DOOM, the Nintendo Switch has just passed its very first test. Alan is a feature writer who has contributed to Kotaku, Nintendo Life and other prominent gaming sites. He has a background in psychology research, the science of creativity, and over 20 years of Nintendo gaming behind him. 30 fps portable was sadly to be expected... but does it reach 60 docked? Or maybe even the option like in "Fire Emblem Warriors" to switch to 720p? Looks like it's 30 FPS. Oh well. Well, its 30fps...give me a moment. DOOMED UNDERPOWERED AND INCAPABLE HARDWARE IT SHOULDNT HAVE BEEN PORTABLE! Fingers crossed that the extra juice from docked mode can bring it to 60fps there. Honestly though 30fps isn't the be all and end all, I'm still looking forward to this game and am fully expecting to enjoy it on a Nintendo console. The screwed up part is people are saying they're out because it isnt 60fps. Guys, here is the third party support. Its not unplayable, very much the opposite! Its still a great game! Best shooter since Goldeneye 007. Can't wait to play this game again, anytime and anywhere. I'm looking to offload my X1, unopened DOOM Collector's Edition. Thankfully, I only paid $44 for it. I want to DOOM on the Go. I don't care if it's 30 or 60 fps. I just want it to be a solid fps. After that........DOOOOOOOOOOOOOOM! And here's also hoping the Classic DOOMs also get released. It's my fetish. I even enjoyed DOOM on the SNES, 32X, and Atari Jaguar. As expected. The Switch isn't powerful enough to run games(especially Doom) at higher frames. Still i'm very impressed they actually got the game up and running. I dont care about 30 fps thing, I have my PS4 version. I need portable Doom with bearable graphics. Well looks like I got one. I think people are really ignorant when they brush this off for being 30fps. The fact that you can have this game on the go is absolutely ridiculous. I would have never imagined being able to play a game of this caliber on the go, even a year ago. Bravo Nintendo and bravo Bethesda for making this possible. I've always maintained that the Pro Controller is a mandatory purchase. Bringing the cost of the Switch up to €400. And then you can add another €50 for a decent sized memory card. Plus another €60 to purchase a game. So you're looking at €500+ to get set up. @EvilLucario @Shiryu I think it will be 60fps, on PS4 its 1080p 60fps so 900p or 720p 60 in dock and 600p 60 in portable should be possible. Even while the youtube video is 60fps, all gameplays look like they are 30fps, in other words video is in 60fps but they still show 30fps footage. Eh, I guess it's acceptable for a handheld, but as someone who will use Switch mainly docked, it just doesn't cut it. @Rayquaza2510 Was Rocket League in 60 FPS footage? I can't remember if it was, I can't go back to check right now since busy IRL. The game looks good. Good to see bethesda going all in. @Shiryu We can hope, it's possible they're still trying to get to 60 docked, as it was telling that at both LA and London events they had people playing it on the portable. Maybe that side is locked and set for 30 but the porting team is working to optimise for docked. Or the upped resolution docked may necessitate a locked 30. Anyway, it's not really clear. One Italian site broke embargo claiming 60fps docked, but we're unsure of its merits. For now we can only talk about what we saw, which was portable play. For me, I think it'll be awesome to have games like this on the go, but performance when docked will be something to look out for. @ThomasBW84 I will keep my fingers crossed. Because stable 60 fps in online multiplayer is quite what every developer should aim at. I am so ready. I need this game NOW. While the lower frame-rate doesn't bother me, let's not pretend like we don't understand why it'd be an issue for some. It's a fast-paced, super smooth shooter that 100% benefits from the higher frame-rate. This might be my first FPS in, oh, about 15 years. Think the last one I bought was Medal of Honour: Frontline, which came out around 2002. Wow. That was the same year I played Doom on a GBA, and I thought that was an unbelievable technical achievement at the time. And here we are today. DOOM on Switch. Yes, please. Original DOOM was 35fps apparently. @ThomasBW84 I think that Italian site need eyes testing to be honest. Oh I see they claimed 60fps docked. Seems strange though as if they were told this why wouldn't everyone else have been told same thing. 30 fps is not a problem for me. I've played games like Turok and Goldeneye at 00 Agent (to unlock cheats) at worse framerates. Did wonder about what the framrate would be. Not too bothered as I've played plenty of fast paced games at 30fps. However I do hope this can be upped for docked mode or they do a Fire Emblem Warriors. @SLIGEACH_EIRE THAT's what you got out of this article? I mean its utter drivel but really?! Last time I played DOOM was DOOM III on PC. I found it far too intense - all that running around with a torch. Glad this sounds more akin to the original game I enjoyed back in the 90's. My body is ready. I should say this before this gets buried. If this at all matters to anyone, I played the game on Switch for at least an hour straight, and literally it wasn't until the very end where it even occurred to me, "oh! I guess I should ask what the frame rate is." The game plays more than fine. So no motion controls, then? Shame. PC is still the only way to play this game. Still, it's great for those who want it, and it's great to see the Switch running a game like this. Perhaps the relative lack of horsepower is not such an issue when all consoles are capable of outputting HD (as opposed to the Wii era, when Nintendo's little machine couldn't even output above 480p). My ageing PC uses a 30fps lock when rendering a 1080p output (internally scaled down to 80% or an effective 864p) at a mixture of low/medium settings. It is my compromise between sharp image quality and playable framerate. The temporal AA is magnificent and makes a world of difference on my 42" telly. Performance is a solid 30 in outdoor scenes and depending on how busy it is indoors can ramp all the way up to 60, but ~45 is typical. The transition between these is smooth in the excellent engine but I tend to lock it at 30fps anyway. Loading times are VERY long between levels, but they aren't too frequent. And yes, that controller stick does get hammered mercilessly for the glory kills. Lego Worlds wasn`t next-gen ? If people are that bothered about frame rate play it on PC. I'll be getting this for sure. @SLIGEACH_EIRE the best way to play racing games is with a wheel. Does that mean every racing game is now £200+. Original Doom ran at 30 fps and is much faster. Saying a modern game is unplayable at 30fps completely disregards how easier they are compared to older games. As most of the time you got your logic sideways. First of all, it's not mandatory, if you can play it with the Joy-Con, which you can. You may not be able to bring your A-Game as easily, and this might hinder the fun, but that's not the meaning of mandatory. It's a luxury that may improve your gaming experience, nothing more. And even IF the Pro-Controller was mandatory and they hadn't included Joy-Con Support at all, it would not add to the console's price, but to the game's price! Or rather spread accross all games you want to play, that play significantly better with a Pro-Controller, which is certainly not the majority (of the close to 30 games I have at this time, only for one it really makes a greater difference so far), and the more there are, over the more games the additional costs are spread. My Point being: If there are few games that necessitate this, your argument is flawed, and if there are many games that make you want to use the Pro-Con instead of the included Joy-Con, it is, too, because the additional cost per game you want to play with it is spread relatively thin. A solid smooth 30fps with motion blur and effects in place will still look and feel fantastic. Destiny is a supremely fast paced shooter at times and it feels amazing in 30fps, so while it will look noticeable to people who have already bought this game for ps4/pc, to everyone else, if all the effects and motion blur is present, the game will look mindblowing on Switch. A locked 30fps will be acceptable. However, I'd much rather trade resolution, antialiasing and render passes for 60fps. I would be happy with docked 720p/No AA/No AO in exchange for 60fps. @SLIGEACH_EIRE I thought that too about the Pro Controller before I got my Switch. But I have to say the JoyCons in the grip works brilliantly for me and same for my friends that also own the console. I'd give it a try before immediately buying a Pro Controller. You might be surprised. @BLP_Software why should I buy a game I already own in my pc? @LUIGITORNADO I dont know the context of your comment. I never said you should buy a game you already own. All I did was mock the expected comments and said itll still be a fun game. Never told anyone what to do with their money. @MegaTen What if this IS the best possible? Oh, and for a company known for pushing 60fps, dont use the N64 especially not in Europe. All I want to hear, that it has gyro aiming. no motion/ pointer controls may be a deal breaker for me. I was hoping Switch would mean the return of the Wii style FPS. @SLIGEACH_EIRE "I've always maintained that the Pro Controller is a mandatory purchase. Bringing the cost of the Switch up to €400. And then you can add another €50 for a decent sized memory card. Plus another €60 to purchase a game. So you're looking at €500+ to get set up." Really? Can't say I've ever noticed you saying that. Well not today anyway. Same here. I will keep my PS4 copy and have the Switch version for quick fixes. Sounds perfect to me! Regardless of the framerate, this game will sell like hotcakes when it comes out. I saw the off-screen footage of this game, it looked very smooth. I know it isn't 60fps, but it didn't look like a jittery mess either! I have a PS4 and an Xbox One, but I will be getting Doom for Switch, despite having numerous opportunities to play this game already on more powerful hardware. Not being tethered to a TV at all times (and not paying big money for a gaming laptop) has started to spoil me. @MegaTen you are claiming the game isn't fluid in gameplay. Sorry dude but the off screen footage I have seen looks fluid to me. Sad to hear they couldn't manage 60fps. DOOM is such a fast-paced title that cutting the frame-rate in half will definitely hurt the overall experience. I'll have to skip this one. No 60 fps = Doom is doomed. First person shooter requires 60 fps or its not fun. I will wait for Hollow, it looks better than this. Neither a fan of Doom nor Shooters in general but am so gonna buy this to keep the train rolling. Also portable shooter maybe gets me hooked up. 60 FPS vs 30 FPS does not mean the game won't be as fast. It just won't look as fluid. I really don't care though I am getting it regardless. I'm so gonna buy this. I'm not defending 30 fps but you're being flippant to disregard an entire game because of it when first impressions are GREAT. Was the game targeted at 60 fps for other platforms? Yes. Can it be beaten comfortably at 30 fps? I'd bet my money on it. It's after all a console single player game not a twitch shooter like Counter Strike. @sparkyfilm no later than December 31.
more shooters like this, less regenerating health duck and cover tactical stalling whatevers, just give me a super shotgun and let me get rolling. The DS line didn't have one single game in this vein. calling DOOM "dumb" isn't an insult, it's what I want to see. @Pandaman Sadly, you left out the most crucial piece of information: does it support the gyro or not? @carlos82 I grew up with 50hz refresh rates. So less than 30fps and games just flat out running slower with slower music and everything is normal. And Ill say right now, thats far worse than stable 30fps. @MegaTen In multiplayer MK8 runs with 30fps refresh on either side of the screen, so while its still 60fps it only refreshes each side every other frame, alternating. Plus MK64 was 30, look how praised it was. Hell, most of the N64. Most games in Europe before we got 60hz. It would still be fun. Ive seen videos of people playing this sayong yes, it is still the fun DOOM experience. And it doesnt demand 60fps, if it was a demand, it wouldnt be at 30 now would it? The last time I played Doom was when it last made an appearance on a Nintendo console. Doom 64. So I’m so looking forward to this and it’s already on Pre order. As to is Wolfenstein as I last played this on a MS DOS PC, again pre ordered. If they can do these two then they can do Call of Duty, or Battlefront, or Serious Sam, or Half Life, or Tomb Raider....... You get my drift. @BLP_Software You damn right there mate This looks amazing for me I cant believe it looks that good and on a hand held, I'm pretty excited about this and Wolfenstien who cares if they dont reach 60fps they look stunning and I bet they hella fun to play. cant wait for other 3RD party games, The switch is looking betterr and better as time gos on. So excited by this. 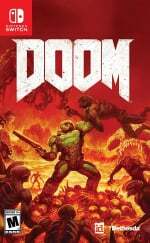 If not because you know it is DOOM on the switch but it shows that Bethesda is trying. Not gonna lie it is making the other game companies look bad IMO. I think western developers still have a little wiggle room for excuses because they were burned by the WiiU. Capcom on the other hand has no excuse. why on earth is OkamiHD not coming to Switch or at least bringing monster Hunter to the west? Day 1 purchase for me. I just want to let everyone know we're getting conflicting reports on what the framerate is. We have atleast one report of it being 60 FPS but for now I would assume it's going to be 30 FPS. @shani Well, the system was heavily tethered to a stand, so I couldnt easily move it around in my hands (even though I eventually did.) Nobody mentioned anything to me about motion controls, I dont remember the system moving anything on the screen by default, and I wasn't able to take the joy cons off the system. Sorry, that's as much as I know! Shame at 30 FPS. Will have to see how it runs first hand. @ThomasBW84 Gyro aiming or twin stick only? @MegaTen I think the game is immersive because its fun, which is not down to solely frame rate, and is in fact more down to its mechanics and how the game operates and what you do in the game. The game isn't fun purely because it plays at 60fps. Its fun because of what you as the player do. FPS is only one part of that, and to say it simply wont be fun, is disingenuous. To me, the fact that Bethesda are letting journos play DOOM and SKYRIM and report their opinions shows a certain confidence in the final game. I'm optimistic that both games will turn out well on Switch. I know there will be complaints, but I'm happy to see this on the Switch. So if you didn't notice any motion controls, I guess there aren't any. Pity, I would have double-dipped if it were 60fps. At least I get to save some money over the upcoming months! @MegaTen I've played DOOM on PS4. It's great. I can also play Sonic Generations, another game demanding reaction times, at both 60fps on PC, and 30fps on PS3. I can jump between the two just fine. I do that with a lot of games, actually. As I said, all I care about, is that it is stable. Generally speaking I don't care what the FPS is so long as it stays within 1-2 FPS of its target. Higher is better yes, but not necessary for me to have fun. I find an FPS that fluctuates far more jarring than playing something consistent. But I'm not also going around telling people it's unacceptable if a game doesn't match my expectations and is therefore bad and that's fact. So shrug. I will take the ability to play on the go over 60fps. That is why I love the Switch, gaming doesn’t have to end if you step away from the TV. Somebody else mentioned this....but I think it's pretty weird for people to be comparing the portable experience of Doom to the home console experience on PS4 and XboxOne. From what I can tell we only know about the performance for it in portable mode right? So wouldn't it make the most sense to keep comparisons to the PS4/XboxOne versions for the docked mode? @BLP_Software it's not even close to unplayable. It's a stupid statement to discard it simply because it's not 60 FPS. Most console games are running at 30 FPS currently and these band wagon hoppers are only clamouring on about it because they heard it's 60 FPS on the other consoles. I'd be willing to bet most people didn't even know it was 60 FPS on consoles until this was announced, in fact I didn't actually know it was 60 FPS on consoles. @SLIGEACH_EIRE how about nope to that? I' ve played the entirety of BotW, MK8D and now Splatoon 2 and the JoyCons are totally serviceable. And I'm not planning on buying the Pro Controller anytime soon. If anything I'd rather buy another pair of those little buggers to be able to couch-play x4. @shani It really seems like they put a lot pf work into getting this to run. Not sure if a lack of motion controls dictates a "lazy" port. Not every feature of the system has to be used. I don't think it'll be an issue for me based on the footage. Still looks fast and responsive. It's crazy to think that we'll be playing a game like this on a portable system. @SLIGEACH_EIRE No, you're not. Nothing here is mandartory. Very nice to have for sure, but not mandatory. That said, I did indeed drop 500 when I purchased mine but I was prepared to do so and had saved a bit so it wouldn't hurt too much. I'm sure even more cash will be spent by the time this generation is done. Anyway, DOOM is something I can't wait to play. @blockfight I've never used the grip, not once since my day one switch purchase. I do like th Joy Con though, particularly because you don't have to hunch. You can let your arms relax or move, even stretch your arms up in the air, whatever. I like that. 30fps, if it's stable should be fine. I mean back in the day we played games like Goldeneye, Perfect Dark and Turok 2 in single digit(sometimes) frames! Hines: We haven’t done anything on a Nintendo platform in forever. Breath of the Wild being the runaway colossal hit that it is, there’s certainly some belief like, “Hey, if you like open-world RPGs where you can explore and do what you want, Skyrim might be a good fit for you.” I don’t know what the exact size is, but some number of people who own Switches have never played Skyrim before. It’s a new thing for them, and for folks who have played the game, the ability to take it on the road—you’re going on a trip or commuting to work, it’s a great time. And Doom is a completely different kind of game from what everyone else is doing. It’s a very visceral, violent, bloody, fun first-person shooter. We’re excited. They both have their place in what’s going on with that platform. Hines: Probably no more so than any other platform. Every time you go to a new platform, there’s always going to be challenges in terms of how they do this or do that differently from the PC. But we feel like we have something that represents the game and looks really good. Some games may look as good as Doom on the Switch, but I’m not sure that anything looks better. It’s an impressive-looking game and it’s still really fun to play. Hines: Honestly, it’s been a long series of them. They came out to see us before they unveiled the Switch to show us what the hardware was like, what they were doing with it. We’ve been in constant conversation with them, and not just about the two games we have now, but about our whole approach to the platform going forward – what we can do, best practices, what things are a good fit, what they’re excited about in what we’re doing. We’re obviously excited about these two games, but it’s not as if we’re going to just do these two games and that’s it. We want this to be the start of a relationship that we build with Nintendo and Nintendo fans. @BLP_Software @MegaTen I expect to find 30fps perfectly playable simply because there's no way my reaction time is faster than 1/30 of a second. I don't believe I'm alone. @Markgo Not to mention that a lot of the last gen shooters run 30fps on PS4 and XBOne as well. Destiny 1 and now Destiny 2 for example. Both run on 30 fps and I could not care less! The gameplay is still smooth as hell and tons of fun to play! Same with The Division. Runs fine, plays fine at 30 fps! @SLIGEACH_EIRE I've been playing the Switch since launch day without a memory card. And while I do like my Pro Controller, I'd hardly consider it mandatory. I play a lot of games without it, and my kid almost never uses it. The only game I've played with Joy-Con and really not been happy with is Spla2oon. That and Doom are probably the only games coming in the near future where I would consider the PC mandatory. And yes, you do have to buy games to enjoy a console. In other news, you have to buy records to use a record player. Doesn't mean the cost of the records is part of the cost of the record player. Yes, you've been saying these things for a long time now. You've been wrong for a long time now, too. All the 60FPS folk drive me insane. I literally cannot tell the difference. Movies are shown at 25FPS as that's above the level what the human eye can detect individually. Do you all demand TV starts doing 60FPS? No. So be quiet. 30FPS will do me fine, thanks. Remember when there was a spate of releasing Gameboy Color versions of AAA titles like MGS? Those were inferior versions. No one moaned about frame rate and graphical sacrifices in those days. I remember Doom 3 graphic engine was too heavy and bugguy even when running on expensive pc graphic cards. Game was pretty mediocre compared to Half Life 2. Havent played new Doom but it seems they make it right this time and the new game runs like a charm on Switch cause of "vulkan" api and already being extremely well optimized for low end pc's. Probably this and Odyssey will compete for all time "best graphics" category. @Indielink I don't know what you're referring to, it's not like making it run on the Switch is that hard. And yes, every essential feature of the Switch should be used. It's not like I'm asking for HD rumble support here, just basic gyro aim, which is an established technology (used by Sony, HTC, Valve and others). Aiming with that crutch (the right stick) is just inferior and not enjoyable, it has to be either a mouse or gyro aim. @JasmineDragon I just saw your comment by accident, but I have to say: the Pro Controller is absolutely mandatory. Those crappy tiny Joycons just don't cut it. You don't know the difference until you've played with one of them yourself. It's the best controller I've ever held in my hands. I couldn't care less regarding the frame rate. The real issue is going to be texture quality and output resolution. I think it will look and feel great in handheld mode, but docked I think it's going to really suffer. I play handheld mode 99% of the time anyway so for me this is a non-issue. Finally, Nintendo is truly DOOMED!!!! I don't know why but for some reason, I feel Metroid 4 is gonna stomp all over this game graphically. Still, Doom is Doom. May buy it again. I have it on the PC. Why not for on the go play as well, I say! Oh Bethesda. You are going to do well outta me this year. Come to think of it, last time I played Doom was Doom II on a Macintosh PPC 7100 back in 1995. Best played in single player mode. We had that and Marathon by Bungie at work, which had far superior multi player. Not a fan of gore, so this is a big NO from me. Glad to see it coming for those who want it, though. @BLP_Software all the more reason to buy it on the ps4. 😅 I personally would never want to play this portable anyways. @SLIGEACH_EIRE I agree. The additional purchases of a memory card and pro controller is one ( two? ) of the reasons I have yet to buy a Switch. There is no way I can play games comfortably using the joy-cons. I tried out my buddies Switch. I'm waiting for a more comfortable option on controls, preferably without additional costs. I'm certain Nintendo will make variations of the system, considering it's replacing the 3ds as well as the WiiU. @JaxonH 30fps vs 60fps is night and day...it's painfully important especially for racers. These Nintendo fan boys are only kidding themselves and are in denial. @WaveBoy Im never saying you should buy this over any other version. Im saying and will always maintain that you do best for you. Buy whatever you want. But nothing is "painfully important" aside from not stuttering or running in the teens. It's a nice benefit, nothing more. Calling people fanboys just because they have the "nerve" to say a game is totally playable and enjoyable at stable 30... just makes you look like the fanboy, desperate to discredit a hype game for the system. It's easy to let your bias get the best of you while disguising it as a rational argument. But skipping games over 1/60 of a second isn't rational. Not unless the framerate was already so low it puts you into single digits or teens. And like Obama would say, let me be clear: there's nothing wrong with valuing performance more than portability. But if that's the case, a simple "looks great, but I play mostly on the TV so I'd rather have a version with higher framerate and resolution" would suffice. Desperately arguing to convince people it's inferior comes across as suspect. Very suspect. Just say it's not for you and move on. Anything more and people will start questioning your motives. @WiltonRoots - There are other hidden costs that never seem to come up. If you want to play a Switch, you have to buy a Switch. Ripoff. If you want to play it docked, you have to buy a television. Ripoff. If you want to play in table top mode, you have to buy a table. Ripoff. Triple ripoff! These hidden costs easily push the cost of a Switch into quadruple figures. @JudgeMethos I'm slightly worried that MP4 isn't developed by Retro. They did some magic with MP3. I guess MP4 will run on a modified Odyssey graphic engine. · Switch version is 30fps with slowdowns at least in handheld mode, Xbox One/PS4 is smooth 60fps. · All versions have dynamic resolution scaling but resolution on Switch is "low, very low", according to Digital Foundry. · Switch has low-resolution textures.
. Depth of field is downgraded. · Switch's solid state memory/cartridges don't mean shorter but longer loading times (like Rayman Legends). Don't get me wrong. It's great that a new-gen game like Doom is on Switch and I'm honestly happy for Switch owners and because it's a third-party AAA game on a Nintendo console but the Switch version is heavily downgraded compared to the Xbox One and PS4 versions of the game. Also, this engine is very optimised and scalable, it's a real wonder that was praised on Xbox One and PS4 versions, so this is the best of all possible scenarios. Just accept people are happy to play it running 30fps. Some people are so adamant that doom can't be played at 30fps that they want to tell other people that they can't enjoy it. By the way I can buy doom and wolfenstein on PS4 but guess what. I am gonna buy the inferior versions instead. @bimmy-lee Hidden costs left right and centre. Anti-consumer. Not everyone's got a grand spare just to play a 12fps port on a potato. Am I getting the hang of this? @BlueOcean yeah of course switch hardware is to blame for rayman's awful loading times. Have a day off! @kobashi100 Have a day off? LOL I'll post whenever I want, thank you for your unjustified rudeness. My comment is absolutely fair. I am fair. Don't put words in my mouth, I didn't say it's Switch's fault. It's just a fact worth mentioning since many people say that Switch has shorter loading times because of the cartridges/solid-state memory. For those giving the game a chance like myself I say I hope we all have fun. For the rest who in their comments and opinions come off cynical, elitist, bitter, ungrateful and generally miserable I say to you I truly hope you find peace, happiness and enjoyment in that which you choose to play. We all have choices and nobody is forcing us into anything we don't want to do. I get the feeling some of us take pleasure in complaining and decrying the things that others seem to be enjoying or want to enjoy. It's kinda sad when you analyse it. If I could choose between 60fps and gyro aiming, I would rather have gyro aiming. @WiltonRoots - You're doing great! Just make sure to copy and paste that into every thread for the next six to eight months, and you'll be a pro. It's just your opinion after all, and you're entitled to it. Are you lot also aware that 30FPS means for a more cinematic experience ?? Anybody claiming the Pro Controller or a Memory Card is mandatory should be forced to change their name to 'wrongy mcwrong' and then post up the actual dictionary definition of 'mandatory' that presumably they are unaware of. I have this on a high-end pc(cooltoys007 is my steam name if you think I'm lying)and I couldn't careless if it's 30fps. Oh my word. You're trying really hard there. Everybody knows Switch isn't as powerful as PS4 or XB1 there so I'm not sure all the effort was worth it. I enjoyed the hell out of Goldeneye and Perfect Dark back in the day in N64, and those games ran at like sub-10 frames per second. This doesn't look like my type of game, but I'll probably buy it to see what it's like and to support it and future 3rd party incentives. @electrolite77 I don't know why you come always like a sad and angry person, I'm just stating my opinion on a comments section. Go to Digital Foundry headquarters and complain there. My comment is a reaction to Digital Foundry's article and I think normal people like to know the facts, I already said this port is good news so get over it and ignore me if you don't like my comments like I do with the people that annoy me, because I'll keep saying my opinion and reflections anytime I want so don't bother harassing me because it doesn't work at all. Just saving you time. Also, grow up! It's about time. @Thierry Perhaps there's a demo coming to the eShop and you can try it first. I also loved Goldeneye 007 multiplayer at 10-15 fps but that was in 1997. 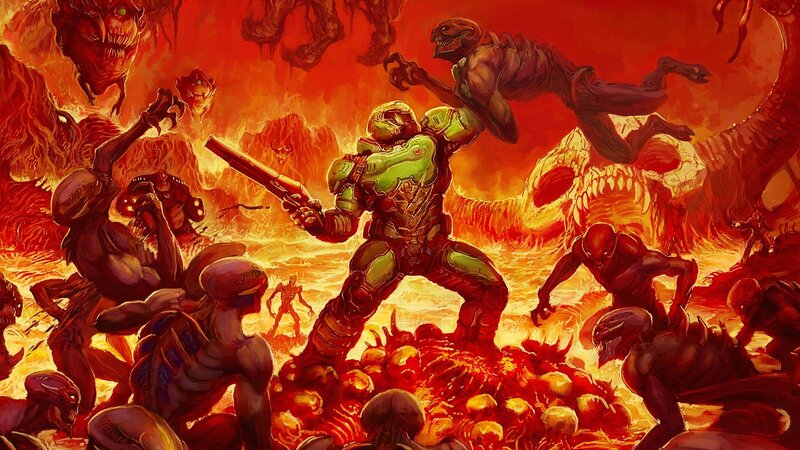 There are plenty of Nintendo gamers have never played doom since doom 64. The drop to 30fps won't effect these people one bit. The developers are bringing doom and other games to a whole new audience. Props to them for doing it. Interesting to read that nintendo went to them during switch development. Props to Nintendo! Also I love DF. They are the best @ what they do no doubt. But there analysis using a custom built PC really is irrelevant. Doesn't prove anything at all. It's not a 1:1 conversion. Is it 30 FPS only while portable or while docked as well. If it is 30 while docked that may be a dealbreaker for me and I might just get it on PC. @SLIGEACH_EIRE compared to buying a launch PS4, $399, $60 for a game, $60 for 2nd controller(since that's what you get buying a procontroller to go with joycons, which could be 3 controllers), mandatory hard drive if you actually want to have more then 3 games , and mandatory online subscription $50, totaling almost $600. My switch cost me $600 too for everything you said and 2 games. Now I have 23 games and with my kids wanting to use it and with mario coming, our PS4 will be sold for another switch if no one minds. And Nintendo has always had atleast decent ports every gen of AAA games. Just not every multi plat everyone wants. Doom, skyrim, wolfenstein are all great games and I've only played 1 of them. So 2 are new to me if I was going to play them on my PS4, I would have, but I'd rather have it portable. If the switch had a port of every Wii U game, it would still be the best console to ever exist because it's for both home and on the go. @Thierry I have never been able to get used to gyro aiming. I wish I could, but it throws off my accuracy so much because it causes my aim to move at unexpected times. The last time I play Doom on the go, it's on my tiny Game Boy Advance SP, now I'm glad I can play a more dynamic modernized version of Doom on the go. The trolls and naysayers can argue all they want as long as Doom on Switch is great, that's all I care about. doom on the go is what gaming is all about! I was really upset about the 30fps thing....then I remembered I don't care at all about frame rates and never will. Haha. The game looks great on the Nintendo Switch, day one purchase for me . I am one of those people who don't care about 60 fps 30 fps or the difference between , to me Zelda Breath of the Wild looks and plays fantastic and I know it's not 60 fps so for me that definitely don't make or break a game for me. You never see Japanese users complained about "30 fps". I know this because I am in one of their forums. They only care about the game more than anything else. It is only the childlish western kids who concerned too much about "30 fps" on the friggin' go. There, go and play on the go...what more could you ask for??? Be grateful of what you have! If it wasn't ported, you guys get angry and crying like a kid. Even if it is ported, you guys still get angry because it is 30 fps. Can't say I expected different. I'll still be getting this since I didn't get it for my Xbox One. All these fake "frame rate elitist" lol. Just get a PC and never play on anything else then...SMH. Id rather have portability + minimalism over anything now a days. Unfortunately this isnt Japan where actual "commuting" and lounges are a thing. Of course the graphics and framerate would have to be cut back, the Switch is not as powerful as PS4 or a modern PC. It's also PORTABLE. And that's the awesome thing about it. If you're looking only to play docked and don't care at all about the portability, then you should just stick to PS4 or PC. @SLIGEACH_EIRE so you've "always maintained" the pro controller is mandatory for a piece of hardware you always slam for being a "handheld"??? How does that work??? @shani It sounds like you missed the fact that I have, and love, a Pro Controller. I just don't think it's mandatory. I guess it comes down to what you like to play on the Switch and how you are playing. It is indeed a great controller, but if you're mostly into RPGs, playing in bed or on the road, you're definitely not going to consider it mandatory. I grant you that if you like shooters and use the Switch as a console exclusively, the PC is worlds better than the JC. But that's not everybody. I never played can't wait to pick this game up! Also imao people are like "DOOM is the only fps that MUST be 60 fps if it isn't the cart will explode." I use to play minecraft pvp on a $400 craptop so ya I think I can handle a steady 30 fps. I'm sure most games on my Xbox one s run at less than 30 frames, in fact I bet a lot drop to single figures in parts. Obviously the pc gamers will feel it at less then 60 and I know Doom managed 60 on console but it's a more power console. Anyway this is great news regardless! Among all the will it/won't it comments I'd just like to thank Alan for a great write-up. Really enjoyed the language in this one, as well as the points made. There's an article on Kotaku now, just regurgitating what other publications have reported, but the word is that this plays GREAT at 30 FPS. @SLIGEACH_EIRE Cost of game, although required, isn't really a consideration if comparing to other consoles.. They all need games.. Secondly.. Im only just now starting to fill up my internal mem, and added in my card ... which cost me $18 AU (32gb) which is around $12 Euro and works fine. If it's a steady and smooth 30fps, then it's not an issue at all. Most of the average players don't even know or care about fps... they just want the game to run acceptably smooth. For those who already played the game on other platforms, the compromises made might be too much, but to me, that this games is playing relatively smoothly, is only but awesome news. The only DOOM I've ever played was the original one on a MS-DOS PC way back when I was in college, so this is awesome no matter how I look at it! Doom looks great. And from the videos we have seen, while it may be running at 30fps, it looks like it is running just fine to me. Combat is fast, guns blaze, demons attack, takedowns are responsive. As someone who played it on PS4, from what I've seen, I'll be picking it up again for the Switch. @BLP_Software have you played DOOM on PS4 or XB1? This game NEEDS 60 fps. Where did all you frame rate > resolution fans go? @gatorboi352 I have played DOOM on PS4. Considerably so. Thanks for asking! The game clearly doesn't need it, as its playable. Necessity would indicates "cannot function without" and believe me, DOOM at 30fps looks mighty manageable. Now, you are free to disagree with my opinion, but it doesn't change the fact that for many, it's fine. And remember, if you don't like something or think it's good enough, don't buy it, but also don't force your will onto others with regards to how they spend their money! @gatorboi352 Can you explain how 60fps is a must? I've heard plenty of people claim it's necessary, but they've never once included why. @BLP_Software "but it doesn't change the fact that for many, it's fine"
@PanurgeJr have you played DOOM on the other systems? Think of it this way, in Nintendo terms: this is basically the equivalent of playing Mario Kart 8 single player and Mario Kart 8 4 player split. Once you play 60 frames, you can't go back. @gatorboi352 That doesn't answer the question. Why can't you go back? And four player split is perfectly playable, so it doesn't serve as an example supporting your claim. @PanurgeJr i dunno, maybe you can. But I would think Nintendo fans out of any kind of gamer would agree that a game, especially of DOOM's kind (old school twitch FPS) has to have 60 fps as the one thing that has to be there. Obviously a game like breath of the Wild doesn't demand it as much. Then again, a lot of those BOTW YouTube videos running at 60 frames look really nice. @gatorboi352 I'm basing it on the many previews and people here saying yes, that'll do. @gatorboi352 I guess what I'm getting at is that I don't see how it affects gameplay, which is what I think of when you say "deal-breaker" and "must". Yes, I can tell the difference between 30fps and 60fps, just like I can tell the difference between 720p and 1080p and 4K, and if you mean you insist on the best visuals available, I get that; I do too, in fact. But as far as I can tell improved visuals don't affect how games play (obvious outliers like 2600 style graphics and 7fps excluded). My reaction time is undoubtedly slower than 1/30 of a second, let alone 1/60 of a second, so that even at my best multiple frames will pass before I react to something on-screen, whether the game is 30fps or 60fps. And it won't matter whether the resulting effect appears on-screen 1/60 of a second earlier in a 60fps game than it would in a 30fps game, because it will take longer still for me to recognize that and react yet again. There's a limit to what the brain can process, and I just don't see 30fps being short of that limit, or so slow that it changes how a game plays. I can already see it now.. more complaints and entitlements from fans. Its either going to be oh its 30fps only or take too much space for memory or graphics look like ps3. Or the old switcharoo.. day one buy.. game comes out ohh its 30fps, i have to download to play multi ect im not buying this.. that will definetly help get more third party support to switch. @SLIGEACH_EIRE "the Switch Pro Controller mandatory," why do you think that? @Donutman Couldn't care less about it being portable. In fact, it being portable is a hindrance to me. It means it's less powerful than it could have been. Also, comparing Switch to PS4 "launch" prices is irrelevant. Switch is competing with the competition at their current price. Nobody goes into a shop and says 'ah but PS4 was more expensive at launch, I think I'll buy a Switch so'. @locky-mavo Comfort, bigger buttons, better analogue sticks, a proper d pad. 1: If anyone was expecting Switch to hit PS4-levels of performance, then that's your own damn fault. 2: This alone is an amazing achievement, and it bodes well for future support. 3: It's a great game and everyone should buy it. @Iggy-Koopa unfortunately there will be a few nin people that will be picking said games apart. Looking at nba2k and next week fifa (not 1 to 1 scale to ps4 and no journey mode). You can be sure this will be the same case with skyrim and doom. No wonder nintendo doesnt get much 3rd parties. Haha good point. I'm tempted to go back and edit but that wouldn't be fair. If you couldn't care less about it being portable then it isn't the console for you so don't get one and stop commenting on switch items! The Wii U was "hindered" by the gamepad and could of been a lot more powerful without it. And as for your comment about the price difference - so are developers suppose to go "our game has been out for a year and we want to bring it to the switch, but since its now £10 on the PS4 we best charge the same on the switch..hang on cant do that can we as we will make no money, so lets not bother bringing it out at all" - you really think anything would get ported over if they done that and the developers would make zero money which means no new games or ports or anything - you total, utter moron. @Joelols Oh, of course. But then again, said people should probably bite the bullet and move on. I went into Switch with my expectations fully in check, and I will admit that it has even (pleasantly) surprised me on a lot of fronts. This game in particular is a very good example of a third party title done right, and the NBA blunder aside (which smacks of both greed and a lack of optimisation), I'm certain that there is still a lot of good to come. @BlueOcean Switch does have shorter loading times due to solid state storage generally. I say generally, because there are cases when compression for smaller file sizes from games that are initially bigger, extends the load times. These comparisons are interesting but anybody complaining about the performance who doesn't own another Console or a PC to play DOOM on....tough luck. This is the version for you. Anybody complaining about the price who doesn't own another Console or a PC to play DOOM on....tough luck. This is the version for you. Anybody surprised that the Switch struggles to match the performance of the PS4....would you like to buy some magic beans, or the tooth-fairy's autograph? Anybody who wants AAA Third-Party support on Switch but doesn't buy it....don't complain when it disappears. According to Digital Foundry, it's going to run at lower than 720 resolution. At 540p and 30 fps, it's bad. But! people who played it seems to be impressed... so maybe the fast action nature of this game actually masked the lower graphical quality? To be realistic, we shouldn't expect Switch to perform like PS4, it's a mobile device running on battery. @Nincompoop The only thing Digital Foundry tested, was framerate. For resolution, they build their own computer which should have the same strength as the Switch. The computer could run 30 fps on the lowest settings and a resolution at 540p. Which means that 540p is not comfirmed for the Switch version. Even though there is, ofcourse, a possibility that it runs at 540p, I don't think it's bad. There is a lot of people out there who say the game looks good, especially for a hybrid console. Consistent fps is more important than spiking fps. 30fps is more than enough for smooth play. Don't understand why people complaining. @maruse Exactly! I own Doom on the PC and I run it at 60 fps. Yes, my eyes need to get used to a 30 fps game but when they do, it's not a problem for me to play. Except when the game's framerate isn't consistent. People who complain about a game being 30 fps are just spoiled. The argument "fast-paced games need 30 fps!!" is a load of crap too. My friend is arguing exactly what @Saego just said. And to be honest, a huge framerate drop could be a deal breaker on any reflex-based game - imagine a Mario with a low framerate, which could result in several lives wasted on a single level. We're not getting low-fps games for a reason. That said, to me, the game seems perfectly playable. We'll just have to wait and see. Probably Panic Button will include a "downgrade graphics for more fps" option in the port so everyone will be happy. Looks really impressive, I have it on PC and its a great game. From what I saw of the gameplay footage it looks like a more than adequate port! Heres hoping we get some nice beefed up versions of FO3/4/NV/Oblivion! @BLP_Software Yes, I didn't say that it's because of the solid state memory. What I said and let's see if I can make it clear at last, is that even though cartridges and SD cards are associated with shorter loading times, it's not the case with Rayman Legends and Doom. I remember when it was revealed that Switch was going to use cartridges that most people said: "Yeah, no loading times! Yahoo!" I'm sure that you remember that too. Everyone remembers that. Thus, it's something to be noted that this is not necessarily true on Switch even though it is absolutely true for older consoles that use cartridges like Neo Geo vs. Neo Geo CD or Nintendo 64 vs. PlayStation. Surprisingly, Switch has longer loading times when running some games. Doom is a "fast-paced" game to some extent but it's not a racing game. Sometimes you are walking slowly looking for an objective, power-up or how to get out of here, because the path is not always clear and it's not a linear game. This means that resolution is quite important in Doom, but no as much as the frame rate because it's a shooter. The frame rate affects controls and accuracy, but in every shooter I've played a lower resolution also affects accuracy. The joycons are not comfortable for controlling this game, that is an added issue if you are playing in handheld mode. I don't say this, Digital Foundry did in their article. The developer made a great engine but there's a limit to what Switch can achieve, which means that if you know exactly what you are getting with this port and you still want it then good for you, but everybody should know what to expect so they are not disappointed. I like the fact that Doom is available on Switch because it's a good benchmark for Switch and at the same time is a portable game for those that appreciate that. @BlueOcean Well we also know why. To fit on a smaller space, carts require compression. Compression requires time to unpack. Hence bigger games, as some would say "squeezed into a cart", will have load times. Its why Rayman Legends runs better off of discs, amazingly. @ThomasBW84 Well, this settles it. It probably wont be a problem when playing in portable mode on the 720p LCD screen, but I do wonder how it will fare on my 56" LCD... and if it will be too bigger difference from the original PC version and most importantly: How it will affect the online multiplayer. I love the comments from ppl who try to belittle the Switches idiosyncraties when they have very little or no actual contact with the hardware... "I played my friends and the controllers were bad!" Yeah? Well when I play at friends on the X Bone I struggle as I'm used to my PS4 controller. Once you've got yourself a unit then you can give us some feedback on what's required or what's bad with some authority but right now your just blowing hot air. 60fps, mouse/kb. the only way to play. @SLIGEACH_EIRE so the pro controller is the best way to play games on the Switch? 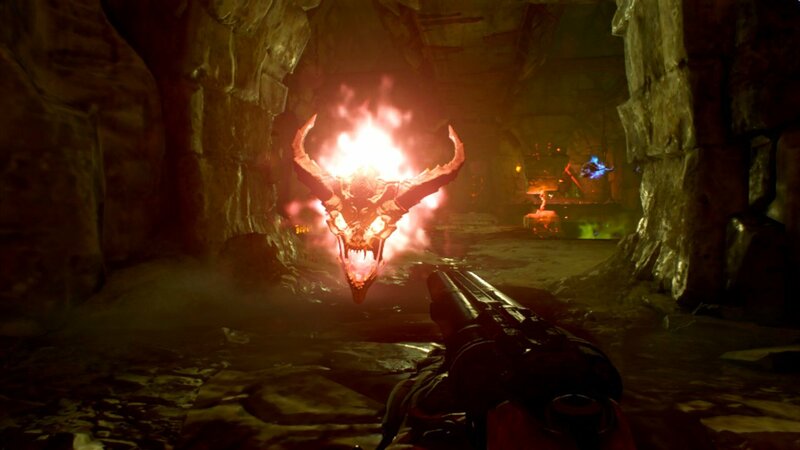 Doom looks amazing and I am going to get it day one. I am proud of Bethesda and way to go Nintendo for starting to get aggressive and getting games like this. @locky-mavo Yes, that seems to be what people say.